As a native Kutztonian, I grew up hearing the phrase “If you ain’t Dutch, you ain’t much” invoked regularly, usually followed by a sly wink. Turns out, in fact, there’s veracity to the platitude, as the Kutztown Folk Festival makes much ado about Pennsylvania Dutch culture during its 69th annual celebration, running from June 30 to July 8. While new attractions are featured each year, essential elements of artisan crafts, music, folk-life demonstrations, family-friendly activities, and food aplenty—all delivered with an authentic Dutch accent—remain firmly intact. “It’s entertaining yet still educational, which I think is really important. There are so many things people today can do for entertainment, but I think the Festival is unique because we combine many aspects, with both fun and learning experiences,” says Festival Director Steve Sharadin, who coordinates with the Kutztown University Pennsylvania German Heritage Center for fascinating presentations on customs, humor, and dialect (the term “Dutch” is a corruption of Deitsch or Deutsch, meaning German). Here, we’ve rounded up all of the things you absolutely must see, do, and eat at this year’s Kutztown Folk Festival. 1. Explore such art forms as hex signs (appearing on area barns), fraktur (vibrantly illuminated lettering and artwork on such documents as birth certificates and marriage licenses), scherenschnitte (intricate paper-cut designs created with scissors), and even the faith healing folk magic rituals of pow-wowing (my first-hand experience with this practice was surprisingly convincing). Continuous shows on multiple stages and seminars in a one-room schoolhouse keep visitors busy throughout the day. 2. For sheer enjoyment, catch a performance of the Sauerkraut Brass Band and other live folk, blues, and bluegrass acts. Join in a cake walk, or become part of the show when a “free for all” follows a folk dance competition between the Miller Family Square Dancers and the Celtic Martins on the Hoedown Stage. Youngster-focused diversions include a petting zoo, pony rides, a 19th century horse-drawn carousel, and a Farmyard Theater with puppet shows and story-telling. 3. Collectors can peruse (and purchase) the past amid a plethora of vintage goods displayed at the Antique Building, and shoppers may browse the wares of more than 200 juried woodworkers, basket makers, silver smiths, leather workers, potters, toleware painters, weavers, and many other craftsmen. Those admiring the exquisite fabric art in the popular Quilt Barn can add a few stitches of their own to history by creating a square for the official Festival Visitors Quilt, made exclusively by attendees. 4. The festival’s most dramatic event is The Hanging of Suzanna Cox. In this theatrical re-enactment of an 1809 event, an effigy of the last woman ever hanged in Berks County drops from the gallows three times daily. 5. With so many diversions to sample, it’s easy to work up an appetite. Fortunately, hearty farm fare favorites are dished up at three family-style restaurants with such selections as barbecued chicken, schnitz und knepp (stewed dried apples and ham with dumplings), sausage, and braised beef, along with traditional sides such as potato filling, pepper cabbage, and cottage cheese with apple butter. Several whole pigs are also roasted each day. 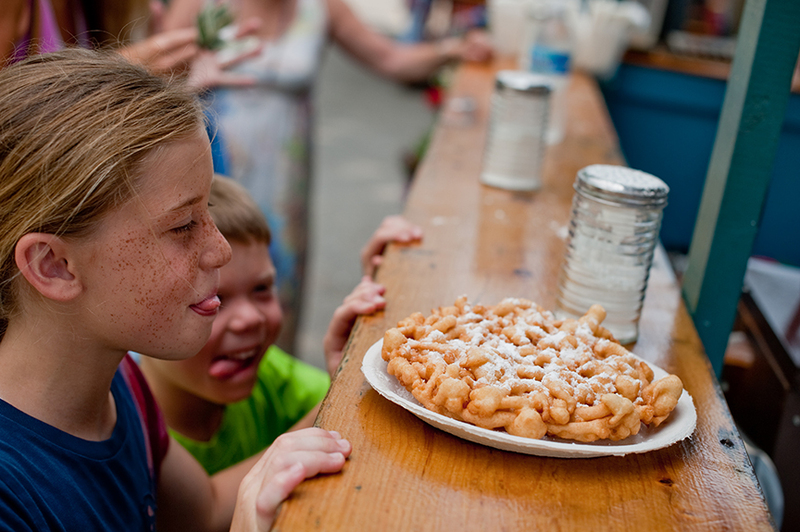 Vendors across the festival grounds offer corn pies, apple dumplings, funnel cakes, shoo-fly pie, and other delights. Aromatic hearth-baked loaves of bread and giant cinnamon buns are pulled from the wood-fired Festival Bake Oven, among the oldest such traditional outdoor ovens in the state. And a Beer Garden enables guests to quench their thirst with local and regional brews and wines. For a non-alcoholic beverage, go with an old-fashioned birch beer. It will “swallow itself well,” as they say in Kutztown. 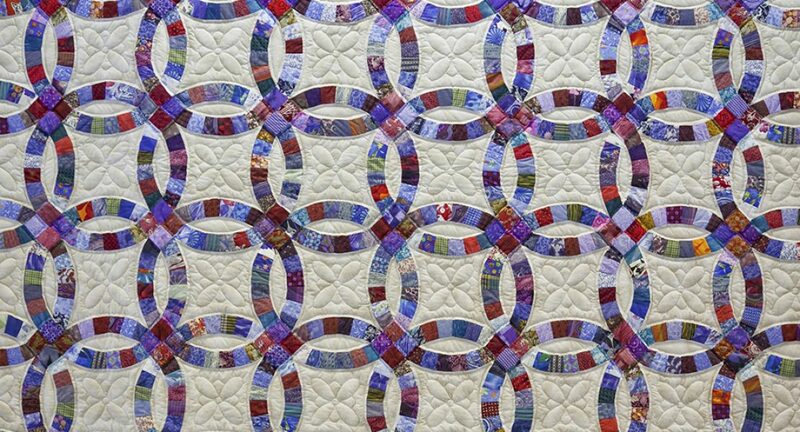 With the largest quilt sale in America, the Quilt Barn has garnered worldwide attention. Each year, well over 2,000 quilts are submitted for entry, though only the finest 1,500 examples of colorful craftsmanship and skill are accepted for display and sale during the festival. “They have to be of a certain quality,” explains Sharadin. Of those selected, Quilt Sale Director Carol Heppe and her staff choose the top 25 quilts, along with the three best wall hangings, to sell at a live auction held at noon on July 7 on the Main Stage. An added feature this year is the auction of four Star Art-pattern barn signs painted during the course of the festival. All proceeds are donated to the Heritage Center and the Dutch Hex Tour Association for the restoration of signs on barns in the region.